Once Judge Atlee was a powerful figure in Clanton, Mississippi–a pillar of the community who towered over local law and politics for forty years. Now the judge is a shadow of his former self, a sick, lonely old man who has withdrawn to his sprawling ancestral home. Knowing the end is near, Judge Atlee has issued a summons for his two sons to return to Clanton to discuss his estate. The summons is typed by the judge himself, on his handsome old stationery, and gives the date and time for his sons Ray and Forrest to appear in his study. But the judge dies too soon, and in doing so leaves behind a shocking secret. Great listen for a road trip. I'm a big fan of Grisham books and especially those read by Michael Beck. 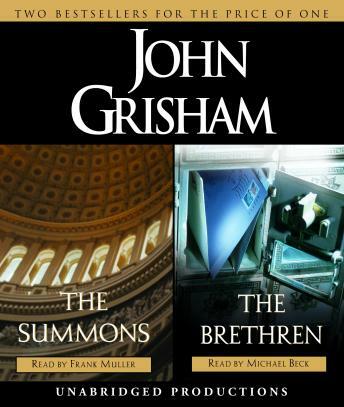 The Summons was classic Grisham with all the twists and turns we love.